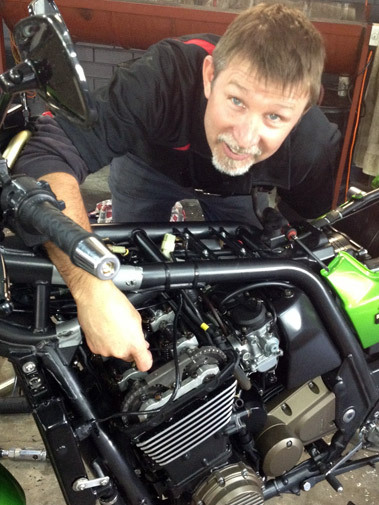 With over 25 years in the motorcycle repair industry, we can give you great insights in how to care for your bike. Courses at factotyfortysix are designed around the class. We have a maximum of six at one time to give great teacher to student ratio. Classes run for 3 hours with generous amount of question/answer time. Junior classes for students 12 to 16 years of age are specially tailored to suit our junior riders and these kids will be able to conduct general maintenance after attending a course and will be able to recognise potential issues with their machines, and let their guardian know before major costs occur. Road bike classes are for road riders, specially tailored to road riders, and therefore their age group and bike type, ie sports, touring, or cruisers. Women only courses are available also. Factory Forty Six also provides bike detailing course and bike restoration courses.